In this sequel to Time Meddlers, Deborah Jackson’s first time-travel fantasy novel, Sarah and Matt again try to rescue Matt’s father from entrapment in shifting times and places, to bring him back to the present. Ultimately they fail in their mission (promising more installments in this adventure series), but the story of their attempt is an exciting one that takes the two young adventurers to Holland during World War II using the time machine invented by Matt’s father. At this time of the German occupation of Holland, danger is everywhere, and Matt and Sarah have the additional menace of their enemy, Nadine, to contend with. 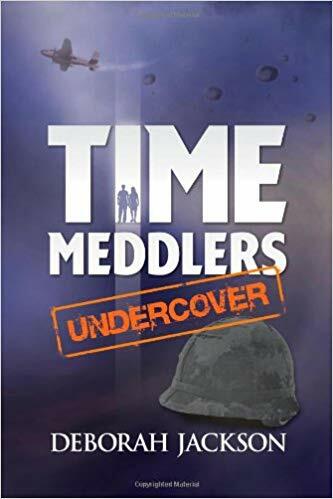 Probably best read after reading Time Meddlers, which introduces the characters and provides context for its sequel, this is an enthralling story that will have middle-grade readers turning the page to find out what risky situations Matt and Sarah will place themselves in next. Information about the English spy network and the Dutch resistance add historical context to the story, and readers are even introduced to famed diarist, Anne Frank. Also included are a Historical Note which outlines some of the facts revealed in Jackson’s research for the story, and discussion questions and activities for reading groups.